One huge trend we’ve been seeing is Rose Gold. Watches, rings, pendants, and earrings all have been superbly popular in the rose color over the most recent passing seasons. My personal prediction is that it is only going to be getting more and more popular over time. 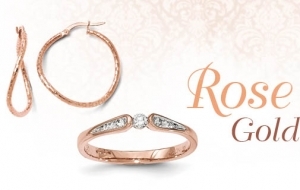 We have even been seeing more Rose Gold in engagement rings especially. Our Bridal Bells engagement ring collection is sure to light up your world while our Seiko and Pulsar watch collection will have you arriving in time! Whether your timepiece is not working and needing replaced, or you’re going to surprise her with the perfect Rose engagement ring, we have it available for you! Our products are affordable! Don’t forget we offer 12 months interest free, same as cash, financing and 90 days layaway. Come see what we have for you!